Rigid Marine Lights - D Series UNIVERSAL - Dezod Motorsports Inc - Home of the automotive performance enthusiast since 2002. Big Power in a Small Package – The Rigid Industries D-Series LED Light is one of the most versatile lighting products on the market today. It produces extremely high output while consuming very little power. Its compact size and shape allow the D-Series LED Light to fit almost anywhere and be used for virtually any lighting application. The D-Series Duallys have gained steam in use as fog lights, scene lighting applications, as well as marine spreader lights. The Duallys with Amber LEDs have proven that when used as fog lights they help to cut through the fog, dust, dirt, or even water. Marine Grade – The Marine Series products are given special attention due to the elements they will be exposed to in a marine environment. The aluminum housing receives a chromate conversion coating that acts as a corrosion inhibitor against elements such as salt. We then give the housing a high quality, UV-resistant powder coat finish. We use 316 marine-grade stainless steel hardware that receives a coating that’s been tested for over 1,000 hrs of corrosion resistance. The mounting bracketry included with our marine products is also 316 stainless steel. This product does not include a wire harness or switch, due to the fact that most installations on marine equipment are custom and require smaller holes and unique components. Hybrid Optics (Dually Series) – Our patented Hybrid optics system is the most powerful, most efficient LED optics system on the market. Utilizing a combination of lens and reflector, the Hybrid optics system captures the maximum amount of light emitted from the LED and projects it exactly where you want it. 20º Flood Pattern (Dually Series) – The Flood version of our Hybrid optics system is a great option if you’re looking for a good area light. While offering just over half the distance of the Spot version, the Flood provides twice the area coverage. The Flood is perfect for those looking for an area light at an affordable price. Specter Optics (D2 Series) – Our patented Specter optics system features 50% more LED’s than our Hybrid optics in the same footprint and is specifically designed to cover more area. By incorporating a reflector with no facets or orange peel, the Specter optics system produces an intense, smooth beam with minimal wasted light. Wide Pattern (D2 Series) – The Wide version of our Specter optics system projects a less concentrated beam to provide better visibility of a larger area while still reducing the amount of wasted light. It produces the same lumen output and center intensity as the Driving version, but its scalloped design allows more light to spill to each side for a wider horizontal dispersion. Quality Construction – Our circuitry is designed in-house to be more powerful, be more efficient, and generate less heat. Our durable aluminum housings feature custom, over-sized heat sinks which keep the temperature down and allow our LED’s to run cooler and brighter. 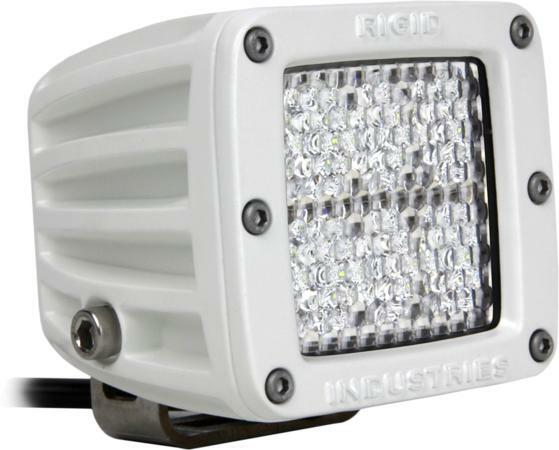 All Rigid Industries LED lights receive a high quality powder coat finish, a custom-molded rubber seal, and an unbreakable, scratch resistant lens. Rigid Industries LED lights are engineered to withstand whatever you, the road, or nature can throw at them.